Herod I or Herod the Great (Hebrew: Hordos הוֹרְדוֹס) was a major Roman client-king of Judea approximately 37-4 B.C.E. in Jerusalem. Known to history as a ruthless man who did not hesitate to kill anyone who might have threatened his throne, Herod also proved himself to be a capable administrator and far-sighted ruler who reigned over a territory greater than any Jewish king following Solomon's era. He navigated the treacherous political waters of the Roman Empire during the reigns of Mark Antony, Cleopatra, and Octavius. His leadership also helped to build the economic might of Judea by founding cities, expanding religious sites, developing agricultural projects, and creating a relatively stable government during a particularly tumultuous period. The Jewish historian Josephus wrote extensively about Herod's reign both in his The Jewish Wars and Antiquities of the Jews, and thus more is known about Herod than any other Roman client-king in history. Herod is best known today from references to him in the Christian Bible. Herod's most famous project was rebuilding of the Temple of Jerusalem, greatly enlarging it and making it into the most beautiful in its time. Some of his other achievements include: the rebuilding the water supplies for Jerusalem, building his own palace in Jerusalem, refurbishing and constructing fortresses such as Masada and Herodion (Herodium), supporting the financially troubled Olympic Games, and creating whole new cities such as Caesarea Maritima and Sebaste. He also engaged in substantial relief programs during periods of drought or famine and influenced Rome to protect the rights of Jews in the Diaspora. Herod regarded himself as head of the Jews throughout the Roman Empire, of which they comprised approximately 10 percent. This enhanced his power, since Judea was a relatively small province. Herod wanted to make Judea more cosmopolitan and favored Hellenized, Diaspora Jews in his appointments. His concept was that Jews would be second to none as contributors to art, culture and learning and he no doubt saw himself as a religious reformer, “trying to drag an obstinate and conservative ... people into the enlightened circle of the modern world” (Johnson 1987, 112). Herod's fatal flaw appears to have been his obsessive insecurity about his place on the throne. However, there is also no doubt that there were indeed many plots against him. Nevertheless, his ruthlessness in dealing with perceived threats has earned him a place in history more for his cruelty than for his many positive accomplishments. Herod the Great arose from a wealthy, influential Idumaean family. The Idumaeans were the successors to the Edomites, the descendants of Esau according to the Hebrew Bible. When the Hasmonean Jewish ruler John Hyrcanus I conquered Idumea in 130-140 B.C.E., he required all Idumaeans to obey Jewish law or to leave, and thus most Idumaeans converted to Judaism. Herod clearly saw himself as Jewish, although his credentials as a Jew were challenged by his opponents throughout his career on account of both his Arab-Edomite blood and his Hellenistic tendencies. His father was Antipater the Idumaean and his mother was Cypros, an Arab princess from Petra in Nabatea, east of the Jordan River. The family rubbed shoulders with the great in Rome, such as Pompey and Cassius. In 47 B.C.E. Antipater was appointed chief minister of Judea by Hyrcanus II, who ruled with Roman support. Antipater in turn appointed Herod governor of the Galilee at the age of 25. Antipater was murdered by poison in 43 B.C.E., and this event may have been at the root of Herod's later obsession about his own safety on the throne. Herod governed his region effectively, gaining fame especially for successfully putting down a revolt by the Hasmonean rebel Antigonus and his bands of supporters. For this he was rewarded by Hyrcanus II with an offer of betrothal to his beautiful teenage granddaughter Mariamne. Hyrcanus himself having no male heir, the match was extremely attractive to Herod, as it greatly increased his credentials as a Jewish ruler. He banished his first wife, Doris, together with their three-year-old son, marrying Mariamne several years later. Hyrcanus, who held the title of "ethnarch" from Rome, now appointed Herod "tetrarch" of Galilee. In 40 B.C.E., Antigonus—this time joined by powerful Parthian allies—invaded Judea and marched on Jerusalem where he imprisoned both Hyrcanus and Herod's brother Fasael, who served as governor of that city. Herod came to their rescue, but Antigonus' forces, supported by religious Jews who saw Antigonus as a messianic forerunner and considered Herod's family as half-breeds, successfully defended the city, forcing Herod's army to flee. He first marched south toward Idumea, then toward Arabia proper, and eventually came to Rome. Hyrcanus, meanwhile, had been mutilated by his captors and deported to Babylon, while Fasael was dead, possibly by his own hand. The new Emperor, Mark Antony, received Herod's promise to win back Rome's lost territory for the Empire. Herod was consequently given the title of King of Judea by Antony with the Senate's unanimous approval. With Roman support and after a long struggle against Antigonus and the Parthians, Herod finally conquered Judea and began to rule as king around 37 B.C.E., with Miriamne as his queen. Antigonus was captured and taken to Rome in chains by the Roman general Sosius, where he was executed. Herod then rounded up and executed 45 allegedly pro-Antigonus members of the Jewish council or Sanhedrin in Jerusalem, many of them heads of leading Sadduceean families with ties to the Hasmoneans. Thereafter the council was relegated to dealing only with religious issues rather than affairs of state. Herod seems to have received some support during this time from important Pharisees, who placed less stress on questions of lineage and had considerable support among the populace who had grown disillusioned with Hasmonean elitism. Although the Hasmonean rulers had claimed the title of both king and high priest, Herod was ineligible to serve as priest since he was not of Levite blood. He initially appointed a young man of appropriate lineage named Ananel to the post. This, however, outraged the remaining Hasmonean elites, who favored Miriamne's brother and Hyrcanus' grandson, Aristobulus III. Miramne's and Aristobulus' mother, Alexandra, went so far as to appeal to her friend Cleopatra of Egypt in the matter. Cleopatra had substantial influence with Herod's patron Mark Antony, and Herod was forced to capitulate. Ananel was deposed, and in 36, Herod named the 17-year-old Aristobulus as high priest. Herod was certainly aware that the young man also represented a possible pretender to the throne as Hyrcanus' grandson. A year later, Aristobulus drowned at a party, a supposed victim of drunken horseplay. With Herod under suspicion, Antony summoned him to Laodicea to explain the circumstances. Despite Cleopatra's probable advice to the contrary, Antony declared the matter to be an internal affair under Herod's jurisdiction, and Herod returned to Jerusalem confident of continued Roman support. On the other hand, Antony gave the Gaza, vital because of its access to the Mediterranean, to Cleopatra around the same time, as well as other possessions dear to Herod. Herod further solidified his position with Rome in 32-31 by gaining victory in the war against the Nabatean Arabs, who had rebelled against his rule. Meanwhile, in imperial politics, Octavian defeated Mark Antony and Cleopatra in September 31 at the battle of Actium. Herod, who had by then welcomed Hyrcanus II back to Jerusalem from his exile in Babylon, now had the old former king executed on charges of conspiring against him with the Arabs. He then traveled to Rhodes and declared his allegiance to Octavian, who, as Ceasar Augustus confirmed him as King of Judea in 30 B.C.E. Herod demonstrated his loyalty soon by generously provisioning Octavian's forces on their way to Egypt to finish off Antony and Cleopatra. After the suicide of this famous couple, Herod escorted the victorious Emperor on his way back to Antioch and was rewarded with the return of all the lands he had lost to Cleopatra under Antony's reign. While Herod thus skillfully navigated the treacherous political waters at the highest levels, he now proved incapable of keeping his own house in order. In 29 Herod began to suspect that Miriamne and her family were determined to dethrone him. He had Miriamne put on trial on a charge of adultery. Her mother, Alexandra, no doubt recalling Herod's treatment of her father (Hyrcanus II) and her son (Aristobulus) at Herod's hand, was a witness against her. Mariamne was convicted, reportedly deporting herself with great dignity at her execution. She was 25 years of age, having given birth to five children in seven years. Alexandra soon retaliated by conspiring against Herod, allegedly claiming that Herod was mentally unfit to serve. Herod had her executed without trial. Continuing to fear a conspiracy from the Hasmonean faction and advised by his sister, Salome, Herod then executed Miriamne's brother Kostobar, who himself had been Salome's husband. Antipater was executed in 4 B.C.E., and Herod now named Malthrace's elder son Archelaus—whom he had earlier suspected due to Antipater's influence—to be his successor as king, with his sons Antipas and Philip as tetrarchs. After Herod's death, Augustus divided Herod's kingdom between these three sons, but did not recognize Archelaus as king. Since the work of Emil Schürer in 1896 most scholars have agreed that Herod died at the end of March or early April in 4 B.C.E. However, Schürer's consensus has not gone unchallenged, with several scholars, including Keresztes (1989) Finegan (1998), endorsing 1 B.C.E. as the year of Herod's death. And the body was carried two hundred furlongs, to Herodium, where he had given order to be buried. ... So they threw down all the hedges and walls which the inhabitants had made about their gardens and groves of trees, and cut down all the fruit trees that lay between them and the wall of the city, and filled up all the hollow places and the chasms, and demolished the rocky precipices with iron instruments; and thereby made all the place level from Scopus to Herod's monuments, which adjoined to the pool called the Serpent's Pool. (Flavius Josephus, The War of the Jews or History of the Destruction of Jerusalem). On May 7, 2007, an Israeli team of archaeologists of the Hebrew University led by Ehud Netzer, an archaeologist from Hebrew University who had studied the writings of Josephus and spent 35 years searching for the location, announced they had discovered the tomb. 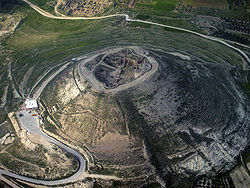 The site is located at the exact location given by Flavius Josephus, atop tunnels and water pools, at a flattened desert site, halfway up the hill to Herodium. The tomb contained a broken sarcophagus but no remains of a body. While Herod was clearly a failure as a family man, his successes as a builder and ruler were substantial. After demonstrating significant skill as a diplomat, fundraiser, and military leader in the campaign that made him king, he continued to govern effectively throughout his career despite the many threats against him, real or imagined. In 28 B.C.E., he held a large festival in Jerusalem to celebrate the completion of a newly built theatre and amphitheatre in honor of Octavian’s victories. While this project alienated religious Jews as evidence of Herod's devotion to corrupt Greek values, it also demonstrated his effectiveness as an organizer, as well as solidifying his reputation in the broader world. In 27, looking beyond Jerusalem after the death of the first Miriamne and her kin, he completed the rebuilding the former northern capital of Samaria to honor Augustus, renaming it Sebaste. In the same year he married the beautiful Samaritan, Malthace. In 25, Herod carried out a massive program of grain importation from Egypt and thus helped stave off the effects of drought, famine, and epidemics. At the same time, he was able to lowers taxes by one third. In 23, he opened his own palace in Jerusalem, naming it the Antonia in honor of his Roman patron. He also opened the strategic fortress called the Herodian, guarding the southern approaches to Jerusalem. His most famous building project, the massive expansion of the Temple of Jerusalem, began around 20 B.C.E. While his motivation for the project was partly to quell resentment of the fact that his own palace dominated—both in size and location—the previous Temple; the grandeur of the project surely brought glory as much to the Jewish religion of the time as it did to Herod himself. Herod took great care to garner Sadduceean support for the project by hiring one thousand priests among the ten thousand builders to ensure that no non-priestly workmen would need to enter sacred areas. By 14 B.C.E., the prosperity of Herod's kingdom was secure enough that he could give substantial aid to the Jews in Anatolia and Cyrene as well as once again lowering taxes lowered in Judea. He also gave significant support to the financially strapped Olympic Games. The inauguration of Caesarea Maritima in 11 B.C.E., presented a marvelous spectacle, rivaled only by the final dedication of the Temple in Jerusalem a year earlier. Herod's troubles with Jewish factions, however, had not ended. Although he succeeded in wining over most of the Sadducees and gained popularity by influencing a Roman policy to protect the rights of Jews in the Diaspora, he was beginning to lose support among the Pharisees. In 6 B.C.E., he executed several Pharisaic leaders who had announced that the birth of the Messiah would mean the end of Herod's rule. Then, in 4 B.C.E., when young Torah-students smashed the golden Roman eagle over the main entrance of Herod's Temple, he had 40 of them along with two of their professors burned alive. The Massacre of the Innocents, if it was historical, also would have occurred around this time. Herod was now near the end of his life and in great pain due to a debilitating disease. To the end, he retained both the shrewdness and ruthlessness of his character. He was buried among great pomp and ceremony at the fortress he named for himself, the Herodian. The Gospel of Matthew gives an account of his being visited by wise men from the east who tell him of the impending birth of the Messiah in Bethlehem. 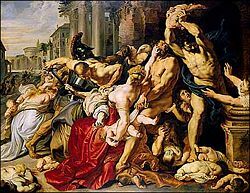 Sensing a threat to his kingship, Herod reacts by slaughtering the infant boys in the area, in what has come to be known as the Massacre of the Innocents. Only in Matthew's Gospel (chapter 2) is this story mentioned, and its historicity is much debated. Herod's ruthlessness as a ruler, however, is well documented. He executed several members of his own family—including his wife, numerous in-laws, and several sons—as well as 45 members of the Jewish religious council in Jerusalem, and numerous other rivals, rebels, and critics. (All dates B.C.E.) 37—Herod begins to reign as King of Judea. 36—Herod names Aristobulus III, high priest. 35—Aristobulus drowns at a party. 32—Start of the first war against Nabatea, with victory one year later. 31 —Octavian (Augustus) defeats Mark Antony. Herod declares his allegiance to Octavian. Herod executes former King Hyrcanus II on a charge of treason. 30—Octavian confirms Herod as King of Judea and returns lands given to Cleopatra by Antony. 29—Herod puts Miriamne on trial for adultery. He later executes both her and her mother, Alexandra. 28—Large festival is held in Jerusalem to celebrate the completion of the newly built theatre and amphitheatre. Herod executes his brother-in-law Kostobar for conspiracy. 27—Herod rebuilds the northern city of Samaria to honor Augustus and renames it Sebaste. He takes the Samaritan Malthace as his new wife. 25—Facing drought, Herod imports grain from Egypt and starts a major aid program. He lowers taxes by one third. 23—Herod builds a palace in Jerusalem and the fortress Herodian in Judea. He marries another wife, also named Mariamne, whose father he names high priest. 22—Building starts on Caesarea Maritima. Rome rewards Herod's successes by adding the regions Trachonitis, Batanaea and Auranitis to his rule. 20—Probable starting date of the expansion of the Temple of Jerusalem. 18—Herod travels for the second time to Rome. 14 —Herod gives aid to the Jews in Anatolia and Cyrene. Taxes lowered in Judea. 13 —Herod makes his firstborn son Antipater his primary heir. 12—Herod supports the financially strapped Olympic Games and ensures their future. He accuses the first Mariamne's sons of threatening his life. 10—Temple in Jerusalem is dedicated. 9 —The inauguration of Caesarea Maritima presents a marvellous spectacle. War against the Nabateans harms Herod's reputation with Augustus. 8—Herod is reconciled with Augustus. He now formally charges his sons with high treason. 7—Mariamne's sons are found guilty before a Roman court in Berytos (Beirut) and executed. Antipater is designated successor to the throne. 6—Herod proceeds harshly against the Pharisees, fearing their hope in the coming Messiah. 5—Antipater, Herod's first son, convicted of conspiracy to murder him. Herod makes Antipas his new successor, but becomes seriously ill.
4—Young Pharisees smash the golden Roman eagle over the main entrance of the Temple of Jerusalem. Herod crushes the rebellion. Antipater is executed. 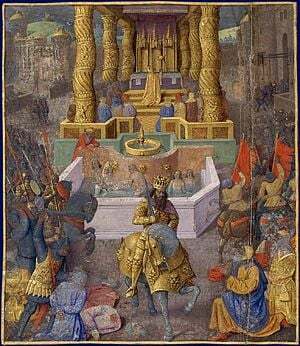 Herod names his son Archelaus to be his successor as king, with Antipas and Philip as tetrarchs. Herod probably dies in March. Augustus divides Herod's kingdom between these three sons, but without recognizing Archelaus as king. Son Antipater, executed 4 B.C.E. Son Alexandros, executed 7 B.C.E. Son Aristobulos, executed 7 B.C.E. It is very probable that Herod had more children, especially with the last wives. Since polygamy was still legal under Jewish law at this time, some of the later marriages were certainly polygamous. Josephus, Flavius. The Antiquities of the Jews, The Wars of the Jews; or the history of the destruction of Jerusalem. Retrieved December 20, 2012. Archeologist: King Herod's tomb desecrated, but discovery 'high point' Haaretz, May 7, 2007. History of "Herod the Great"
This page was last modified on 22 December 2017, at 20:14.